This issue features three pictures taken in shallow water near the pier near the south end of Grand Turk. The shallow water near shore is not like the coral reefs found farther from shore. Shallow water over a sandy bottom attracts different kinds of animals, and the poles of the pier also offer shelter to many animals. This habitat is a good place to find young fish, bottom-dwelling fish, and some unusual invertebrates (say, "in-VER-tuh-brats"; these are animals that don't have backbones). Young Angelfish not like adult Angelfish. They are smaller and have different colors. 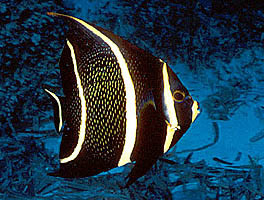 Click here to learn about this beautiful juvenile French Angelfish. 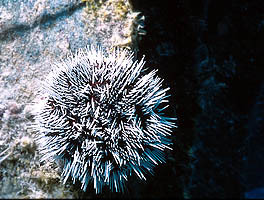 The West Indies Sea Egg is a type of Sea Urchin. Click here to learn about this walking spineless ball of needles. 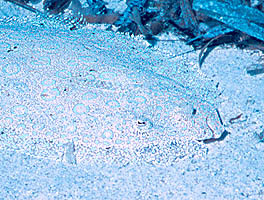 Warm sand near shore makes a home for this Peacock Flounder. Click here to learn about this fish that lives on its side on the ocean floor.